Author Jon UdellPosted on 9 Dec 2018 9 Dec 2018 Categories . Wait wait wait. “It was not possible to read silently”? “Readers” were professionals who read aloud because the audience was illiterate or likely to be so, or because copies were expensive, or because performance was in the nature of the arrangement. We still have professional readers, and bills are still “read out” in the chambers of the legislature. But none of that has to do with the impossibility of looking at a written word and reading it without the mouth moving. This is the same kind of silliness that engenders debates about whether things can exist without names. You can also bet that a professional reader had some concerns that weren’t unlike professional readers’ today, and that a quick silent skim to mark the piece out, followed by rehearsal, when possible, was part of the prep before going in front of an audience. When you’re a performer, you’re always auditioning, no matter how long you’ve had the job. Anyway — I find my experience of speech is exactly opposite, but then I’m a writer, not a performer. When I hear speech, it comes up in my mind’s eye in bookface text, usually before the person’s finished saying the word. There’s no deliberate translation of it into “print”, it just goes, and there’s no trouble about that, maybe because reading goes much faster than speech does. As far as I can remember, it’s always happened — I first became aware of it as a thing that happened when I was maybe twelve or thirteen. It also makes recall of recent conversation relatively easy because it’s not hard to “reread” the text — it doesn’t stay in my mind’s eye, but if I think back I know whether that line looks familiar or not, and which words are uncertain. I’ve wondered if it’s connected to the tendency to see music synaesthetically as colors and shapes — no idea. Makes Bruckner pretty terrific, though I’m not sure he’d have been wild about the way my head connects his music with Odilon Redon. The claim is not that it was physically impossible to read to oneself silently, but rather impossible because for a long time nobody had the idea to do so. Here’s the source; R0ml may have overstated slightly. Your synaesthesia sounds fascinating, never imagined that. Here’s an interesting thing that does happen to me. It just happened when I went back to the podcast to look up that book. I was out for a hike when I was listening to the podcast. When playing it back, and when I got near the segment I was looking for, I could visualize where I first heard what I was hearing on playback, and knew how far to go on the podcast scrollbar — and in which direction — in order to get to the right spot. A variation on this: using TTS as a sort of “looking over your shoulder” check on composition … sentence structure, grammar etc. Hearing things, egregious errors jump right out! True. I don’t think much about how things would sound when writing to be read. But when I’ve written talks — I know, you’re not supposed to, but sometimes I have to — I’m always surprised by how much tweaking is required to come up with a script that can be fluently read aloud. Absolutely yes, that is an art. One need only watch the tele-prompter outtakes for any commercial TV show and the complaint is about the text. I’m reminded of that scatological melt-down by Bill O’Reilly complaining how bad the text was and that he would “do it live”. It’s hard to write for fluently reading aloud, and you see it on nightly news broadcasts all the time when someone hitches on a word/phrase or has start over more than once to read the text as written. I think some of that is valid. I mean there might very well be tropes that work well as literature or even as technical writing, while sounding odd or forces as speech. And (HTML test) vice versa. The power of a text is different when read from when it is copied out. The mere reader never discovers the new aspects of his inner-self that are opened by the text. Because the reader follows the movement of his mind in the free flight of daydreaming whereas the copier submits it to command. Hi Gavin, nice to hear from you! Thanks for the head-up about that! I consulted Alberto Manguel’s A History of Reading (Flamingo), which was published in the same year as Gavrilov’s and Burnyeat’s articles. 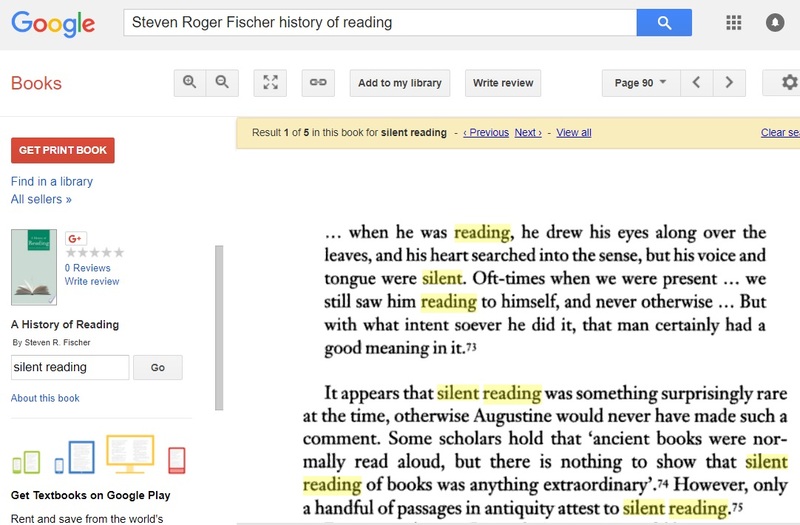 Manguel believes that the passage in Augustine is “the first definite instance [of silent reading] recorded in western literature”. He is well aware of the evidence to the contrary, but he finds it unconvincing. I wonder if R0ml’s source, Steven Roger Fischer, got his info from Manguel?